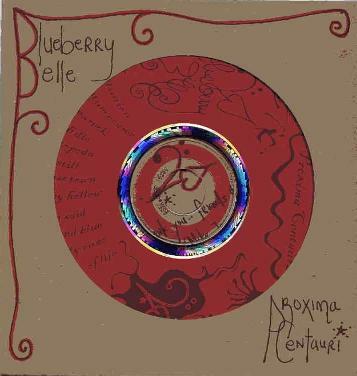 Blueberry Belle - "Proxima Centauri"
Jana Risher is a Los Angeles based musician and this is a solo project on which she plays all the instruments on this sort of darkish instrumental ambient excursion into the unknown universe. It has a very special handmade packaging with very nicely handwritten text and wrapped in a Trader Joe's bag. Jana clearly puts in as much thought and effort into her tracks. There are 12 tracks in 44 minutes. There is no CD text on the artwork or the CD display but the titles can be found on her sonicbids page. She plays bass, guitar, keyboard (piano) and drums. Her guitar and guitar playing is pretty straightforward while she lays down some really nice bass, which leads many of the tracks. The guitar is mostly very dreamy stuff but can seem to lead you down a dark path. Nice melody permeates the air as you float on downstream looking for hidden people in the forests.